As we start moving into the new year of 2017, it’s time to begin thinking about the events, holidays and celebrations ahead. And you know what that means – Valentine’s Day is coming up fast. For the special someone in your life, it’s never too early to plan for Valentine’s Day! After all, you want it to be special, don’t you? Instead of grabbing a bunch of flowers at your local grocery store this year at the last minute, take your time and select something special for your love. Here at Dallas House of Florals, we have a ton of options for you to choose from. Take a look at some of our favorite Valentine’s Day arrangements, below. For your one true love, send our Hugs and Kisses bouquet, to let her know you’re thinking about her this Valentine’s Day. This arrangement has bright white chrysanthemums, pretty pink carnations, romantic red roses and a radiant red vase. For something sweet and pretty, try our Sweet Thoughts bouquet. 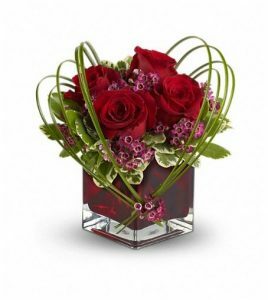 This low arrangement has red roses with purple wax flower accents, and is nestled in a cute red vase. Bear grass gives this arrangement an extra-special touch that sets it apart from all the other Valentine’s bouquets. If your love’s favorite isn’t roses, send our Daisy Daydreams arrangement. This basket is packed with pretty lavender daisies, dark purple asters, chrysanthemums and greenery. Plus, it comes in an adorable white wicker basket. You can’t go wrong with the classic: if you’re not sure what to choose, go with our True Romance bouquet. Choose one, two or three dozen long-stemmed red roses in a metallic-colored ceramic vase. Nothing says romance like traditional long-stemmed roses! For a new take on an old classic, send out Never Let Go arrangement. This low and modern arrangement of 18 red roses and lavender and green accents is a romantic way to say “I love you” just in case you sent the long-stemmed version last year. If you get your order in now, you won’t have to panic the week of Valentine’s Day. Don’t end up panicking at the last minute this year; plan ahead and get a beautiful floral gift your wife, girlfriend or other loved one is sure to enjoy. For more information on placing your order, call us today at 800-873-0917.